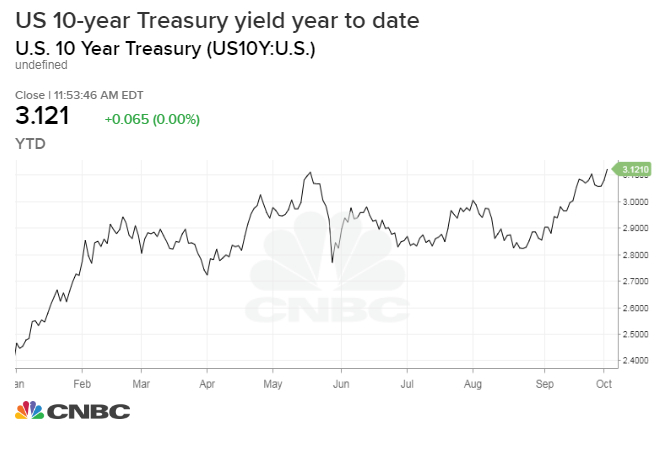 The yield on the 10-year Treasury note hit its highest level since July 2011 and the yield on the 30-year Treasury bond hit its highest level since October 2014 on Wednesday after the release of strong economic data. 30-year Treasury bond rose 7 basis points to 3.282 percent, its highest level since Oct. 3, 2014. The yield on the benchmark 10-year Treasury note also jumped 7 basis points and was last at 3.125 percent at 11:46 a.m. ET. The 10-year rate is especially important given its role in helping set rates for a whole range of business and consumer loans, including home mortgages. The rate on the two-year note hit 2.852 percent, its highest point since June 25, 2008. Bond yields move inversely to prices. “This is still a healthy pace of job gains considering the difficulty that we keep hearing from Corporate America that there aren’t enough able bodies out there,” said Peter Boockvar, chief investment officer at Bleakley Advisory Group. The Labor Department’s monthly update on the employment situation is due Friday at 8:30 a.m. ET.